Watching development naturally unfold, seeing parents discover the amazing feat of a growing human being, are perhaps two of those greatest joys of general pediatrics. It is during the first five years of a child’s life that pediatricians see families and patients the most, and it is during this time that your guidance, assistance and knowledge not only identifies problems but promotes healthy development. The path of child development is neither straight nor narrow. Children vary widely, sometimes leap ahead or fall behind. One challenge that gets in the way of the joy by accompanying families on their journey is the difficulty in detecting developmental problems early; then successfully linking those families to appropriate services. For example, you suspect an issue in language development and refer the parent for early intervention services, only to find out six months later that the child didn’t make it to the evaluation, or they were evaluated and found ineligible. It is as if we have determined that the only thing possible to promote developmental health is Early Intervention – and if a child is ineligible nothing else needs to happen. 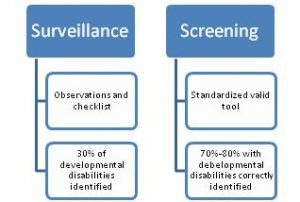 Docs for Tots has been working with 6 health centers in Nassau County to ensure that they had best practice in place for developmental screening. Working with the health centers through a quality improvement framework, together we ensured that the practices were screening with a valid tool 95%-100% of the time. 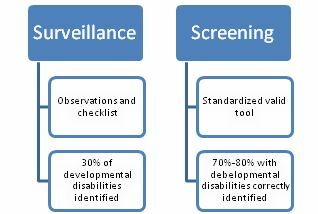 The AAP recommends universal developmental screening with a valid tool at the 9, 18, and 30 (or 24) month visits. Screening was only the start; once valid screening was initiated, children were identified and needed to be connected to services. Many barriers exist to connecting children to services – cultural or linguistic barriers, transient phone numbers, and residences that make follow-up difficult, parental ambivalence, etc. Our work was with safety net health centers, serving children whose social determinants of health and experience of ongoing stress put them at an increased risk for developmental issues. They could benefit the most for access to developmental supports and amelioration. Screening could only go so far for these families and providers – consistent and targeted care coordination was needed. Pediatricians play a key role in child development. They are but one asset in a community of multiple supports for families with young children. Help Me Grow builds a system that connects the existing resources to the existing needs. It starts to ensure that everyone’s good intentions lead to good results. By improving partnerships and connections between the families, the medical community, and early childhood services, we can make a lasting impact in the lives of young children. 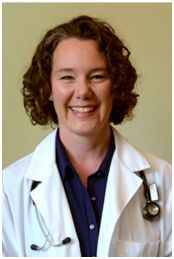 Dr. Elizabeth Isakson, MD, FAAP is a pediatrician and public health practitioner with 15 years experience with Columbia-Presbyterian Medical Center, the National Center for Children in Poverty (NCCP), and the New York Zero-to-Three Network (NYZTT). She is the Executive Director for Docs for Tots.